Hi there, I'm working on some style sheets and we have three heading styles - 1, 2 and 3. For some reason, Heading 3 has an indent on it, and I can't work out to how to remove it. 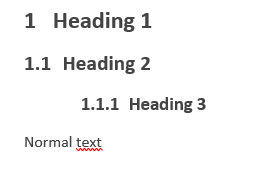 it needs to be set left as with Headings 1 and 2. Since the headings are numbered, the indentation must be removed in the Multilevel List dialog box. Click in the first Heading 1 paragraph of the document and then click Home | Multilevel List | Define New Multilevel List. Click level 1 and change "Aligned at" to zero. You may also want to adjust the values for "Text indent" and "Add tab stop at." See also Number Alignment 2007 and later by Suzanne Barnhill, MVP.